Zincoln cents… er… Lincoln cents. Well, ever since the United States Mint began striking Lincoln pennies with a primarily zinc composition back in 1982, some coin collectors have jokingly been referring to modern zinc Lincoln cents as Zincolns. When the plans came to change the metallic composition of the Lincoln cent, it wasn’t the first time the penny would have undergone a significant overhaul. In 1943, steel pennies were made to save copper for ration efforts during World War II. In 1974, aluminum pennies were proposed to combat rising copper prices. That combination results in a zinc core for the cent with a pure copper coating. This copper coating is what makes the zinc-based coin still look similar in color to earlier, copper pennies. Interestingly, zinc is what coats the 1943 steel pennies. 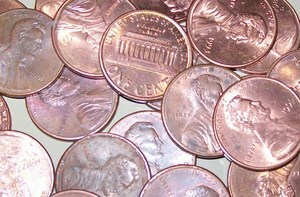 By the way, due to the rising cost of copper, many people now hoard copper pennies! How Many Zinc Lincoln Cents Have Been Made? You might be surprised to learn just how many zinc Lincoln cents are floating around out there. In fact, there are more than plenty to go around for every United States citizen. Over 200 billion zinc Lincoln cents have been made since 1982. With 310 million people living in the U.S., that means there are easily more than 645 zinc Lincoln cents for every man, woman, and child living in the United States! So yes, you could realistically expect to find a zinc penny in your pocket change. The United States Mint does a pretty good job minting billions of coins every year — but the U.S. Mint isn’t perfect. You’ll likely notice that many zinc Lincoln cents, especially from the early- and mid-1980s, seem to have tiny bubbles. These bubbles are due to an issue where the copper didn’t adhere to the zinc core as well as it should. Unless drastic, zinc pennies with bubbles aren’t worth anything more than their regular value and, often, are viewed as imperfections that actually diminish the value of uncirculated zinc Lincoln cents. There are also several notable error Lincoln cents made since the transition to zinc in 1982.